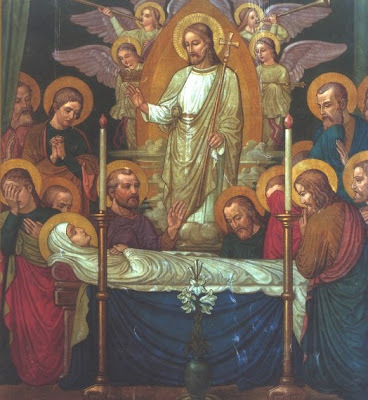 Home › Uncategorized › Happy Feast of the Assumption! Happy Feast of the Assumption everyone! Tomorrow I will be heading down to Orange Beach, AL for the week for the Annual Seminarian Gathering (see August 18, 2010 post for Last Year’s Gathering). So this will probably be my last post until after next Monday. This is the one time of the year when all of the Seminarians from the Archdiocese get together. It is a great time to build fraternity amongst the guys, especially since we are all scattered around in different seminaries. Archbishop Rodi, the Vocations Directors, and the Chancellor will spend the week with us. Please pray that we have good weather and times this week. Before I head down, I thought I would share some shots of things over this past week. On Friday, I was able to meet with a good friend of mine from Furman University–where I went to College. We hadn’t seen each other in 4 years, so we thought we would meet at one of the nicest restaurants in the Wiregrass—Pizza Hut! Hahaha! I decided to capture the first encounter. Patrick lives Mobile now and I am in Enterprise…so after some careful calculations…we deduced that Evergreen, AL was right in the middle. So we met right there for the afternoon at their local Pizza Hut. It was so refreshing to meet up with an old friend. Amazing how you can pick right back up where you left off. Shared some great times together in Greenville and really got to know one another over a 2 month Study Abroad Program in Chile back in 2006. Here we are doing a little PR for the faithful Hut. We are really trying to highlight their “Cheesy Bites” and “Pepsi” while showcasing their ever-fresh salad bar just to our rear. Thanks to the Pizza Hut staff for letting us sit in their Hut for about 4 hours and for this photographic magic. Driving back to Enterprise, I passed through Andalusia, AL. As I hit the main intersection…I ran into one of my past loves–Hawaaiin Shaved Ice! I used to make a DAILY pilgrimage to Sno Biz in high school. Seeing it, I just had to pay my respects. His comment made me chuckle as I witnessed in him the peaceful simplicity and enjoyment of a youth in a small town. Saturday Night, I joined with the Guatemalan Prayer Group for probably the last time. Again they prayed for over 3 hours! Their fervor and devotion to prayer is one of the many treasures I hope to carry with me from Enterprise. They really made we felt welcome each time I joined them for prayer and praise. This past night they really offered some special prayers for me as I head back to seminary shortly. Thank God for them and for their special gift of prayer. Well, again, Happy Feast Day! May the peace that surpasses all understanding come more fully into your lives this day and every day.